When permafrost melts, methane can build up beneath impermeable soils and suddenly erupt, apparently. In the formerly frozen tundra of Siberia, this is exactly what seems to have started happening. This 100 foot-wide hole of some obvious but unstated depth could have been caused by a meteorite, missile explosion or perhaps aliens. But this is not what scientists in Siberia are saying. 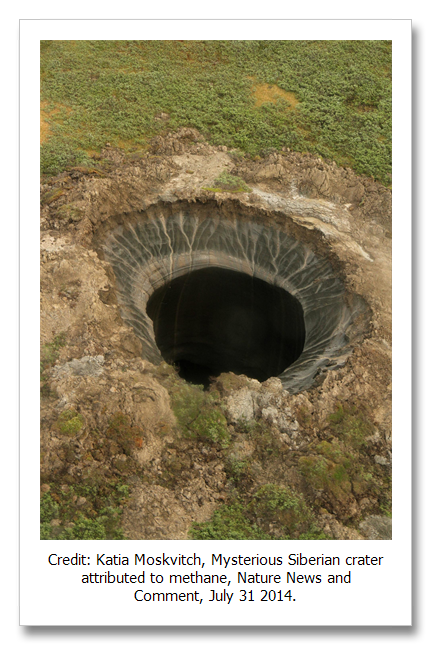 It is likely that melting permafrost containing frozen methane or clathrates were the culprit. Three of these things have been found do far but no eye-witnesses. Air sampled rom the bottom of these eruption craters contained up to 9.6 percent methane, or concentrations that are highly explosive. Natural gas (methane) is commonly found in vast high pressure underground reservoirs that in many cases were created by melting methane clathrates. In the Gulf of Mexico, gas fields like this are common, only they are buried much more deeply, or are they? I have been fascinated for five or six years by under sea images of the Gulf of Mexico on The Google. Take a look at this Google Maps link: https://goo.gl/maps/68y0C The craters and mounds in this image are formed either by salt domes “floating” to the surface of the Gulf floor and dissolving, or gas hydrates melting and erupting. We know the hydrates are there in large quantities in shallow sediments from reporting of the Deepwater Horizon well blowout in the Gulf that spilled an estimated 210 million gallons of oil over a five month period in 2010. And we also know that much of the gas in the Gulf was formed by clathrates in deep sediments. Katia Moskvitch, Mysterious Siberian crater attributed to methane, Nature News and Comment, July 31 2014.